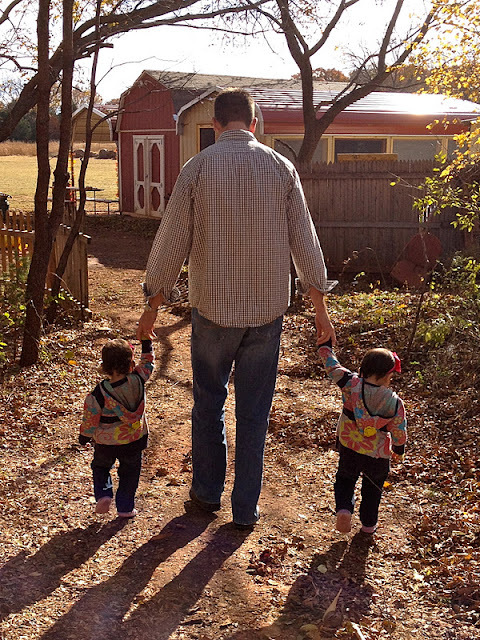 Daddy and the girls entering the grounds. I'm beginning to think I've got a couple of John Deere girls on my hands. They love tractors! 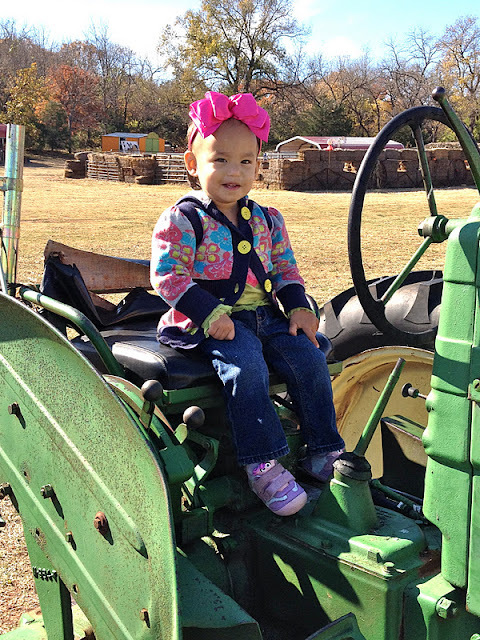 Whether it's a riding lawn mower on display at Home Depot or a construction vehicle parked at the house being built next door, Layla and Jenna start shouting tractor as soon as they lay their eyes on any heavy machinery! Layla: "I look good on this thing, don't I?" Jenna: "Watch out, people! I'm behind the wheel!" Here's the only pic I got of the birthday boy, Trip. Such a handsome, young man he is! Thank you, Trip, for inviting us to your birthday party! We had so much fun climbing the hay bales, petting the animals, going on the hay ride, roasting hotdogs and smores, and eating yummy cupcakes!!! If you're ever up toward Arcadia during the fall season, you should stop by the Parkhurst Pumpkin Patch and check it out. BUT, trust me, you'll want to bring your camera! 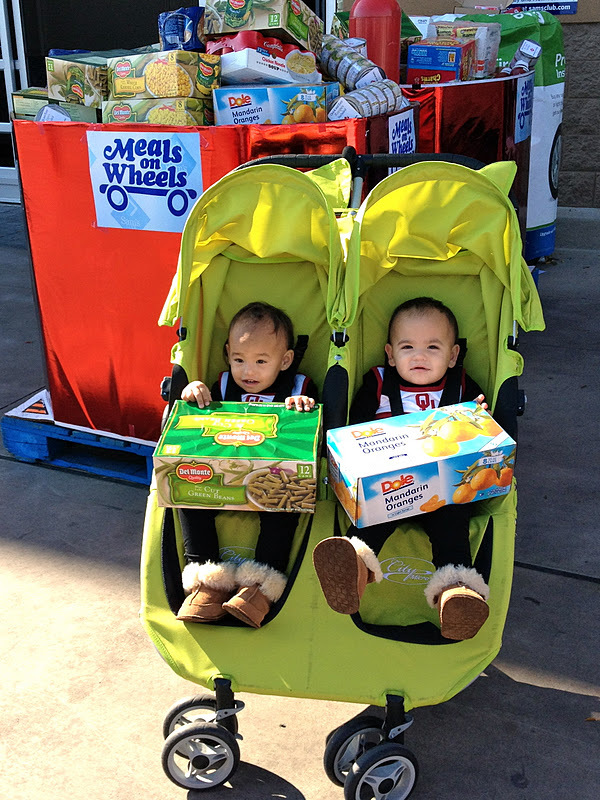 After our Saturday morning Gymboree class, we walked over to Sam's Club to pick up a few things. Out in front of the store, Meals on Wheels had several large containers set up to collect items for their food drive. Layla and Jenna just knew they wanted to contribute, so once we were inside, we reviewed the provided wish list and the girls picked out two of their very favorite foods to donate. I love that they love helping others! Now that we are well on our way into November, I guess I better get this Halloween update posted. To be honest, I've been a little Halloweened out. If you remember, a few short posts ago, I was excited to have the opportunity to dress the girls up numerous times. I mean, I wanted to get my money's worth out of those costumes, you know! But, by the time Halloween actually rolled around, I was officially over it. I am very thankful that our two-doors-down neighbor invited us over for a "Trick or Treat" pre-party because that actually gave me something to look forward to. 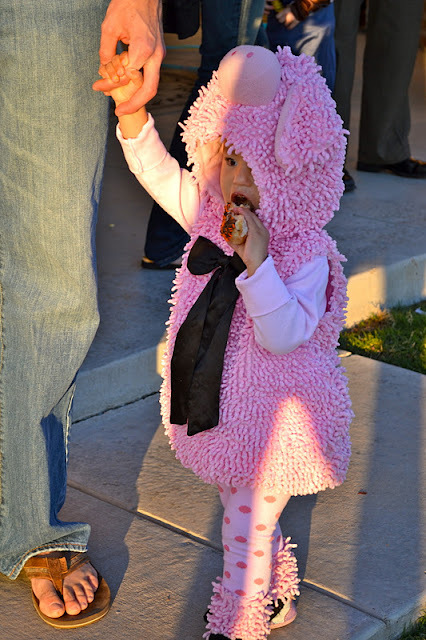 So, once again, we got our little pig and chicken all dressed up and we went to party! The funny thing about hanging out at our neighbor's house with the usual crowd is the ratio of boys to girls. You would not believe all the little boys running around that place. It's always an eyeopener for me because we, obviously, don't have any experience with boys. They are so different! They have weapons and play football and make all kinds of weird sound effects with their mouths! You can see by Layla and Jenna's faces that they are intrigued by boys as well! These two cuties are our twin neighbors. Check out their muscles and their guns! Fortunately, they have no problem settling in...especially when there are hot dogs involved! "Ooh, sissy! The ice bucket!" Vanilla Coke or not, they still got their fair share of sugary treats. Krispy Creme donut, anyone? Layla: "Don't mind if I do!" Also on this night, Jenna discovered juice boxes. 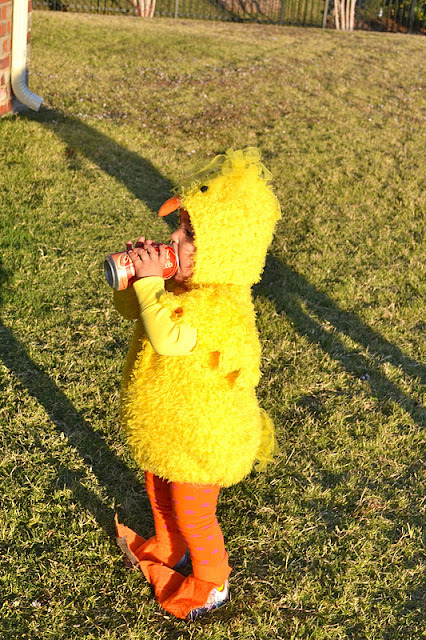 We brought our own sippy cups full of thirst-quenching ice water, but once she "borrowed" someone's juice box, it was all over. She crawled her way up into every seat around the table and depleted all the unattended juice boxes! What could possibly come after all that sugar? Dance party with Whitney Houston, of course! Here's the crew! Layla had enough of her headpiece by this point...can't say I blame her. I was over the costume days ago and I didn't even have to wear it! Another group shot! The three youngest kiddos decided they weren't going to cooperate for this one. 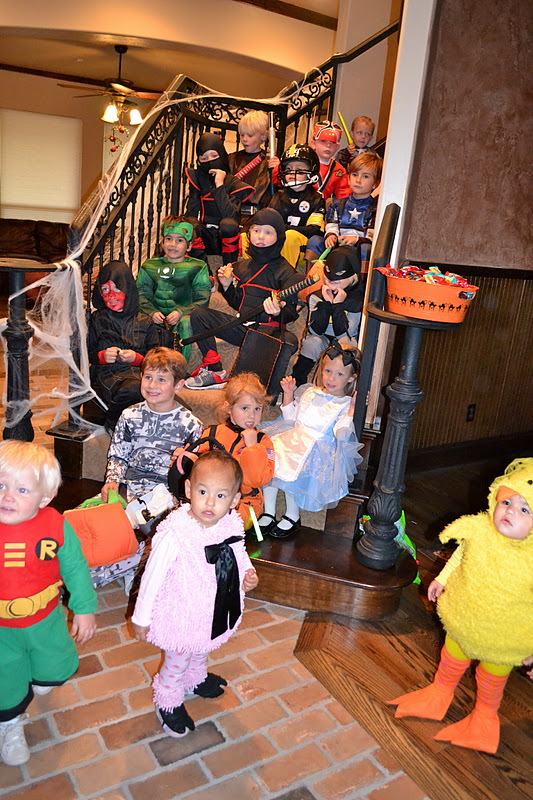 That little cutie dressed as Robin is our soon-to-be neighbor. He is just a few weeks older than the girls and I can only imagine the fights they will have over him in the years to come! 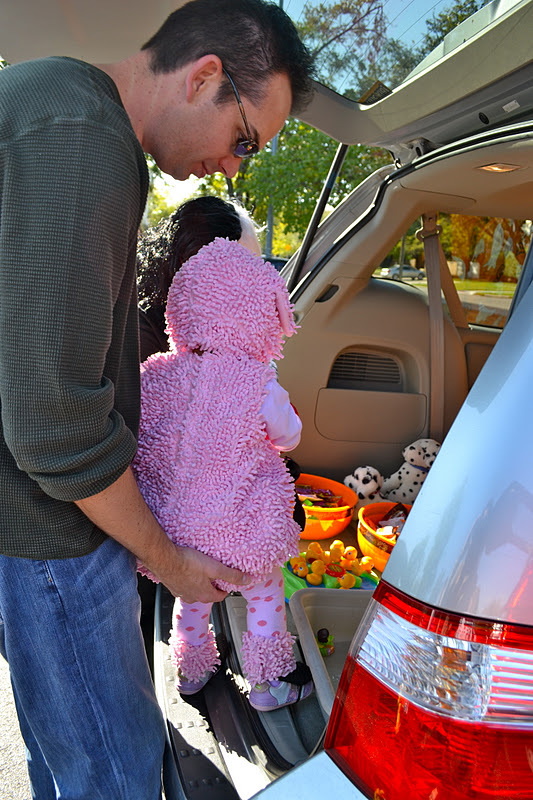 When all the other kids left to go Trick-or-Treating, we headed back home to pass out candy. "Ooh, fruit snacks! We're really digging this Halloween business!" Jenna: "Hey, Mom! I see Toby!" Lolli stopped by to see the girls in their costumes. Layla is showing her the cool blowup display in our across-the-street neighbor's yard. Jenna decided to get a little more up close and personal with the ghosts! As the kids started coming around, Jenna would stand at the end of the driveway with a single piece of candy to give away. It was really cute! 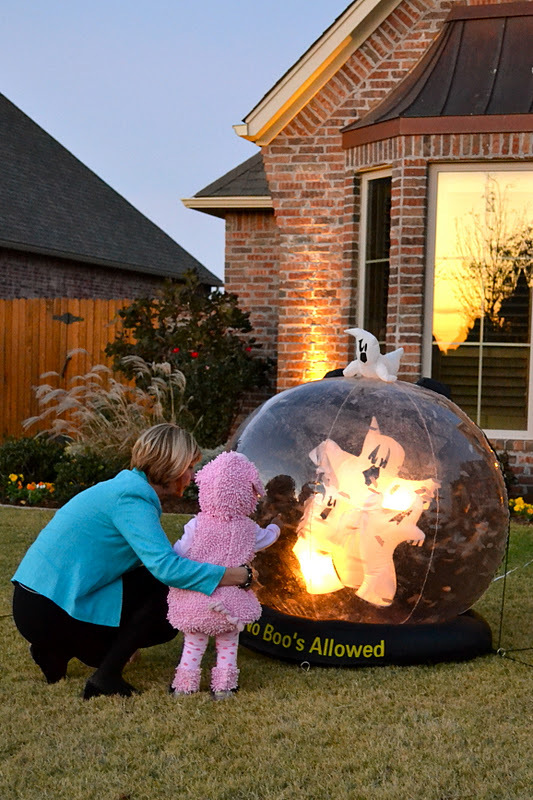 As the night grew dark, Lolli and Daddy took the girls inside to bathe and put to bed. Although, their Mommy was ready to put Halloween behind her, Layla and Jenna had so much fun this year! 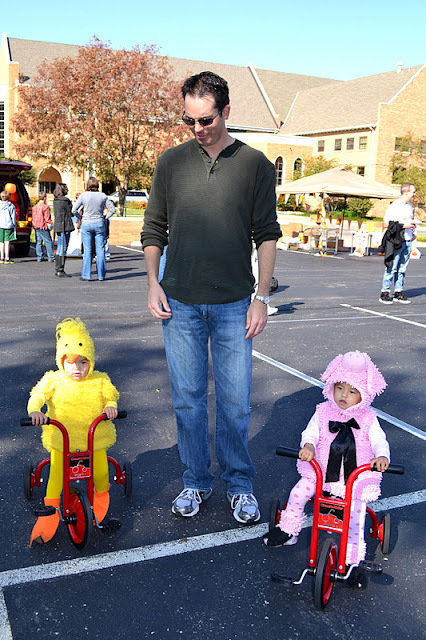 From the photo session to the Gymboree Party, from Monster Dash to Trunk-or-Treat, and then finally Halloween, these little farm animals were such troopers...they loved every minute! Until next year, Halloween...although your spirit (leftover candy) is still haunting me! 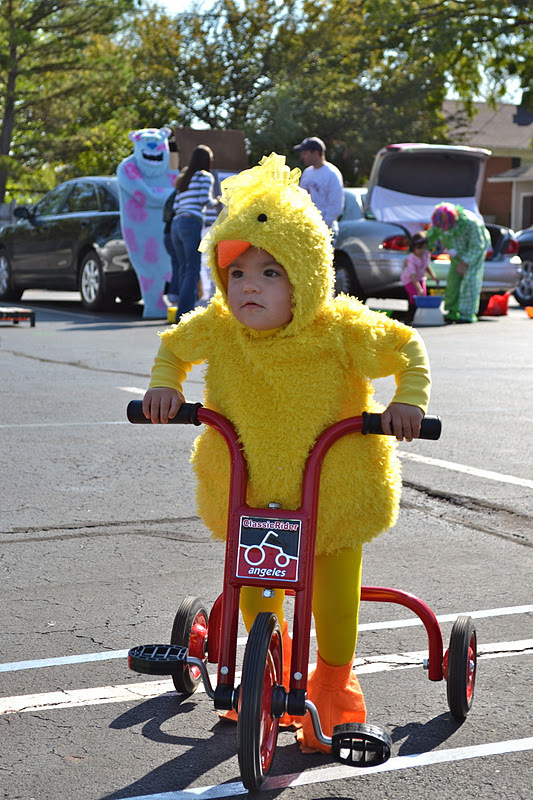 Yesterday afternoon, First Christian Church held its annual Trunk-or-Treat carnival in the church parking lot. 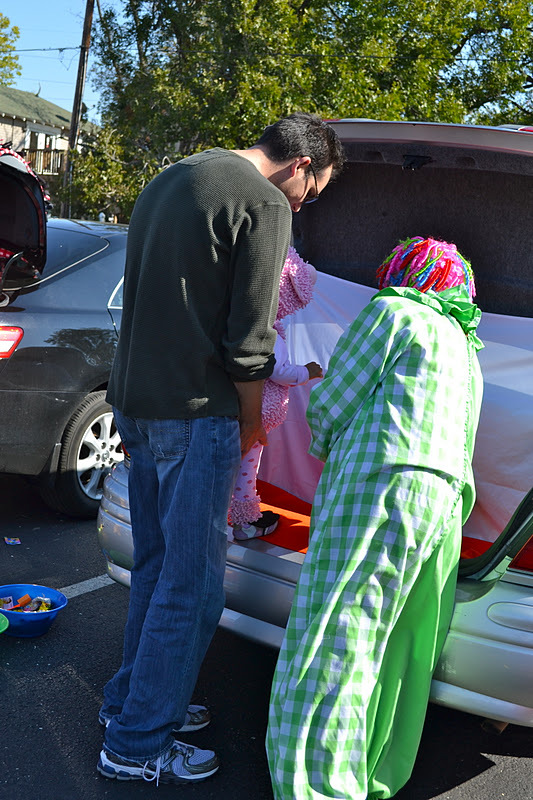 During this event, several families hosted games out of the trunks of their vehicles and kids played to earn treats and prizes. Even better than that, the carnival also helped to raise funds for UNICEF. All week long, kids in the church have been collecting coins from family and friends and everyone turned in their loot at the carnival. Kids helping kids...now that's nice. "Oh geez. Mom has us dressed like this in public again." Jenna was slightly obsessed with the tricycles. We finally pried her off of that thing so we could go to the next event. Cake Walk!!! One of them (I can't remember which) actually won. We opted to forego our prize...baked goods are the last thing we need! Way to go, Layla! Show 'em how it's done! Jenna, do you want to try Ms. Christine's Ring Toss? Jenna: "I really want to go ride the tricycle." Layla is going on a duck hunt...she LOVES ducks! Jenna is back on the tricycles. Layla is bowling with Ms. Pam. 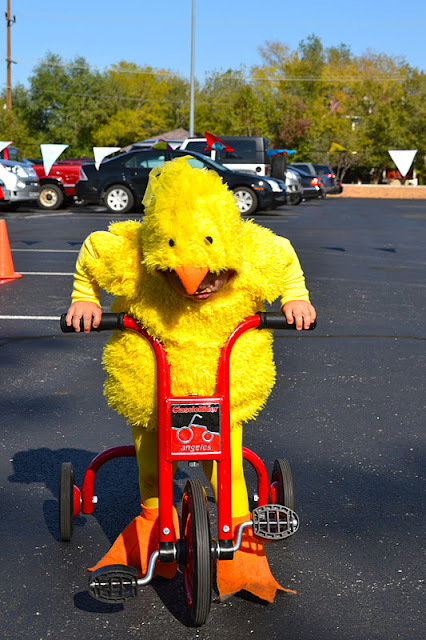 Yep, you guessed it...Jenna is still riding the tricycle. Layla is playing yet another game with the clown! And, Jenna is still riding the tricycle. Time out for a quick snack! Layla: "Yummy, I love pretzels!" Jenna: "I wonder if anyone would notice if I went back to the tricycles?" Layla had time for one more game. Great roll, little piggy! Before we left, Layla and Jenna turned in the coins they had collected throughout the week. I think the girls had a fabulous time at Trunk-or-Treat. One of them, and I'm not naming names, was super upset about leaving the tricycles behind. We had to bribe them with ice cream to get them back into the car! Thankfully, we are not above bribery! 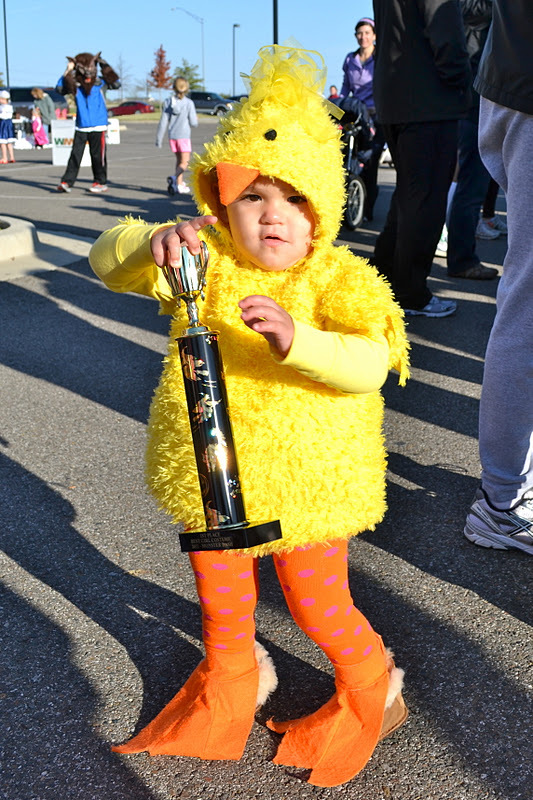 The Junior League of Norman held its annual Monster Dash fundraiser on Saturday morning. 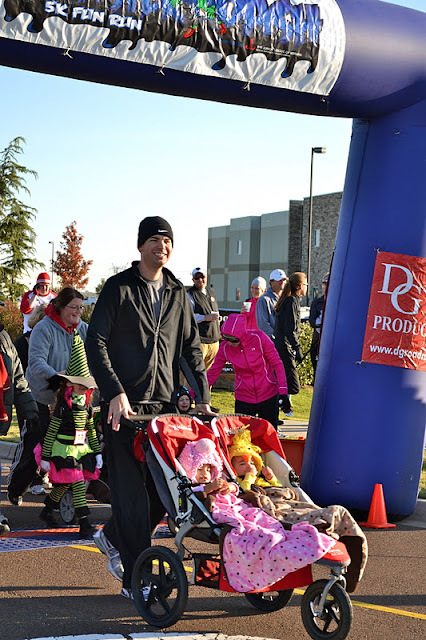 Along with a 5K, there is a 1 Mile Fun Run where participants are encouraged to wear their Halloween costumes for the race. It was a brisk morning, so Layla and Jenna added leg warmers to their get-up and then they were ready to pound the pavement! The girls were just a little bit excited to get started. Along with the mummy, they were the first ones to line up. I think they were a little disappointed to learn they would be racing in their stroller. And we're off! Do you know of anyone else who eats pretzels during a race? Yay! We made it! Here we are crossing the finish line with our friend, Gray, and her mommy, Megn! The girls were so proud of themselves for earning blue ribbons! ...and Mommy with her Chicken! After the race, we lined up for the costume contest so the judges could get a good look at everyone. We won! We won! Layla and Jenna tied for first place! Look at the other cute girls who won trophies too! There were some fantastic costumes! 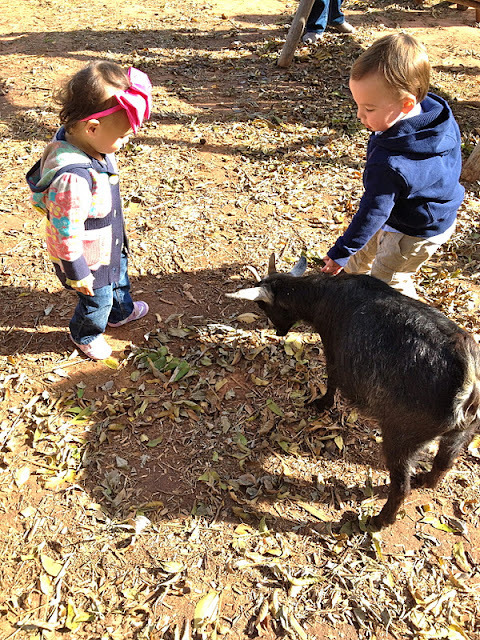 We're so proud of our farm animals! Jenna: "Look what I got!" Layla: "Wow, this thing is shiny!" As soon as we got home, the girls collapsed in the kitchen and started gulping down their water. I guess the race wore them out...or maybe the pretzels just made them thirsty. Our family had a great time at Monster Dash...good fun for a great cause, who could ask for anything more?